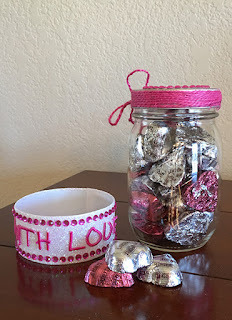 Nothing says "I Love You" like chocolate kisses and heart shaped chocolate candy. 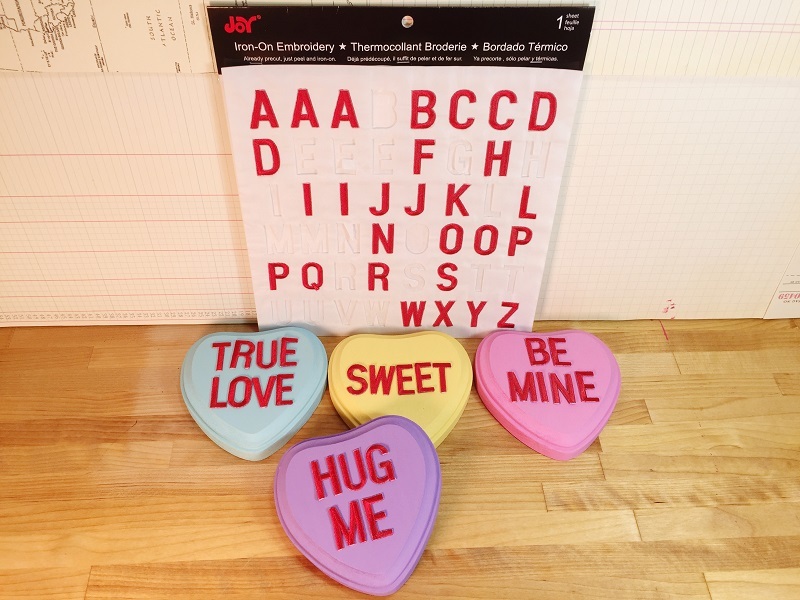 Boxes of chocolates are a traditional favorite of sweethearts everywhere, but a personalized gift is always extra special and these are easy to create. 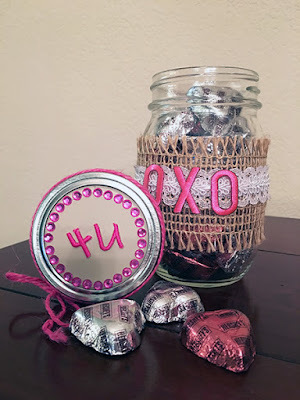 All you need is an inexpensive mason jar, scraps of ribbon and/or trim, baker's twine, crystal stickers, double stick tape, glue and Joy Embroidered letters. Step 1. 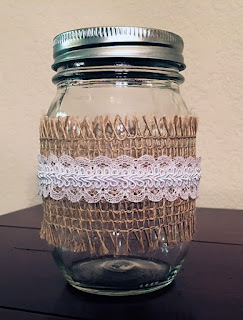 Depending on the "look" you want, wrap the mason jar with ribbon. Step 2. Adhere the letters with a small amount of glue. 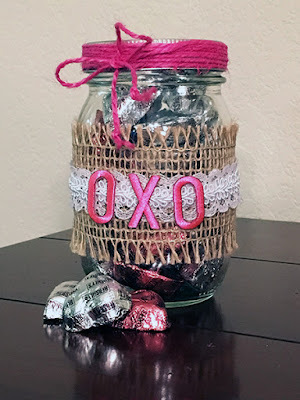 I used the larger X and Os on top of the burlap and lace and spelled "WITH LOVE" on the white glitter ribbon with the smaller letters. I also added strips of pink crystal stickers along the top and bottom edges of the white ribbon. Step 3. Decorate the lid by turning the center disc upside down then gluing it to the inside of the ring. The disc in the lid of the mason jar I used was a creamy color, so this color is now on top. Wrap the outside of the lid with double stick tape, then wind the bakers twine around the edge. The tape will hold the baker's twine in place. Glue 4 U to the top of the lid then add crystal stickers around the edge of the disc to finish. 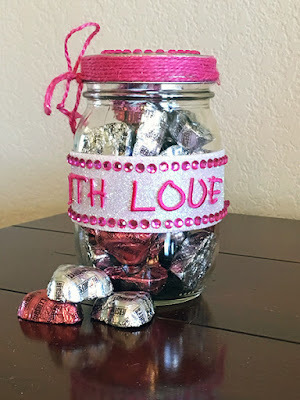 Fill the jar with foil wrapped candy. 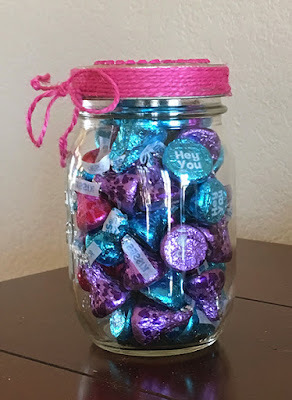 The multicolored wrapped candy kisses looked so pretty, I didn't think the jar needed a ribbon wrap. This would make a quick'n EZ teacher gift...... Enjoy! 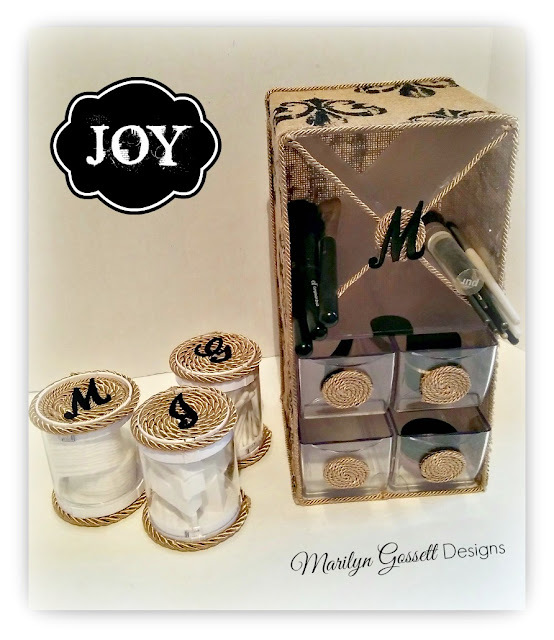 Office and craft caddies are wonderful for organizing all sorts of things at home. I am giving my vanity an update, so I chose several products that I love for this project! Burlap and cording give a timeless look, and they both come in a variety of patterns and colors for embellishing clear plastic storage containers. I've embellished two cubes (one with dividers and one with drawers) for cosmetics, plus a trio of cylindrical jars for cotton balls, cotton swabs and wedge sponges. 1. 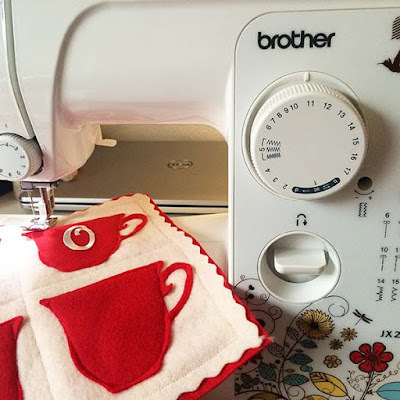 Measure for the width and length that you want to cut your fabric. The cubes are 6" x 6". I measured and cut a 6" x 30" piece for the sides and the top. The back pieces were measured and cut in 6" squares with the patterns matching up before adhering to the storage containers. 2. 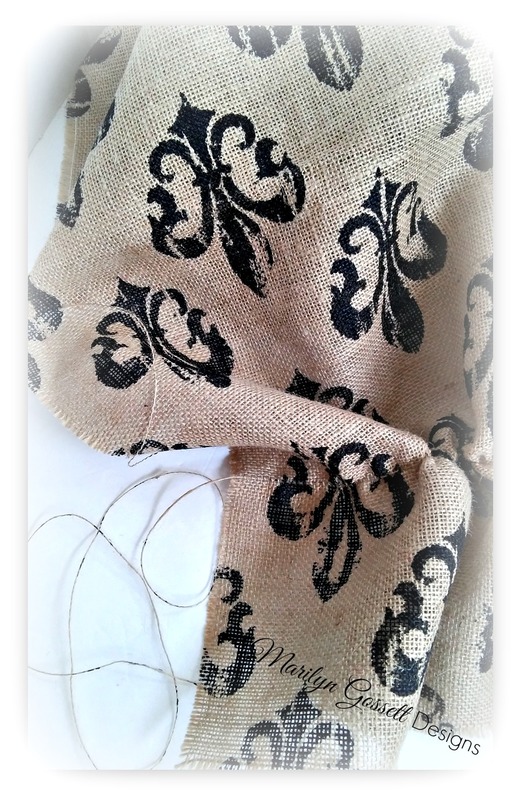 Find a string in the burlap and pull it to the length of the piece you will be cutting. Pull the string all the way out without breaking it. If the string breaks, cut up to the place the string broke off and continue pulling the same string. 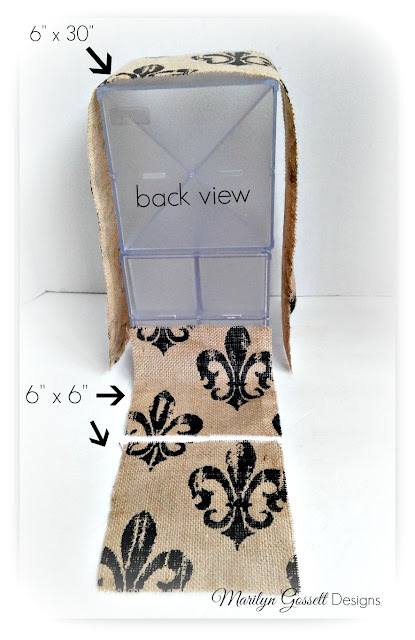 This will give you the guide you need to cut the burlap straight and not get fraying. 3. Below is a photo of the burlap being cut along the guide line. This is a sure-fire way to cut your burlap and be happy with the results! 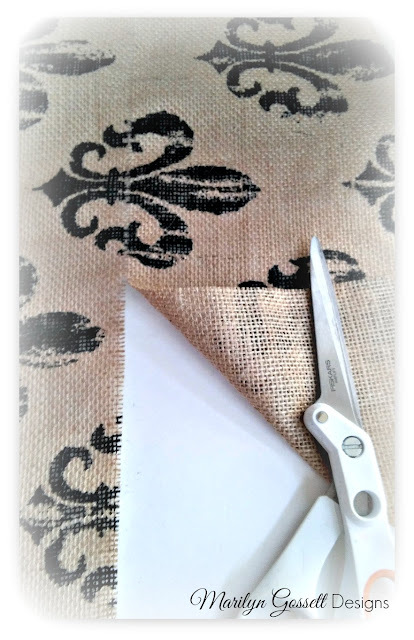 Designer tip: If you are cutting individual pieces for a placemat or the like, pull and remove the strings around each side to create a fringe. 4. I applied decoupage medium to the surface of the storage bins and to the wrong side of the burlap. 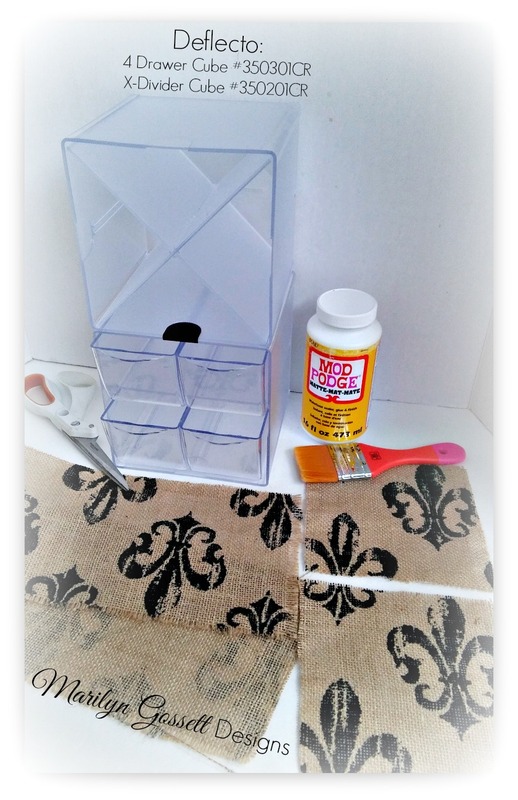 Make sure to cover your surface with wax paper or freezer paper before moving on with this step. Adhere the burlap to the top and sides of the containers. Then finish by adhering the squares to the back. I left the bottom without fabric. 5. Glue the cording to the edges of the containers as shown. 6. Create the cording medallions by pinching one end of the cording together and gluing to a scrap of burlap. Continue by creating a spiral; gluing as you go; until you have the size that you desire for the drawer "handle" or the lid to the cylindrical container. Cut the medallion out; concealing the burlap edges. Glue to the storage containers as shown. 7. Glue a Joy embroidered letter to the medallions. Enjoy! 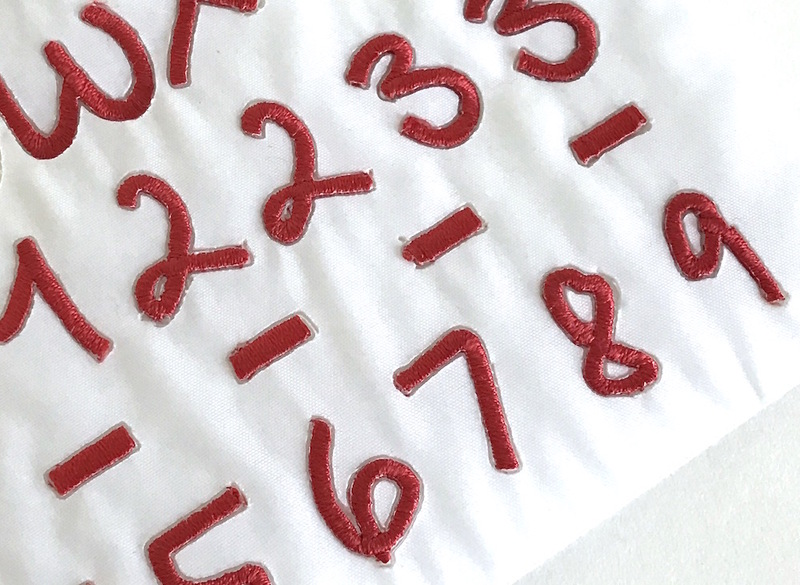 I discovered some of the Joy letter/number sheets include little dashes, which are perfect for making faux stitches on a Valentine's Day card. I designed this cute card to fit inside a standard #10 business envelope. 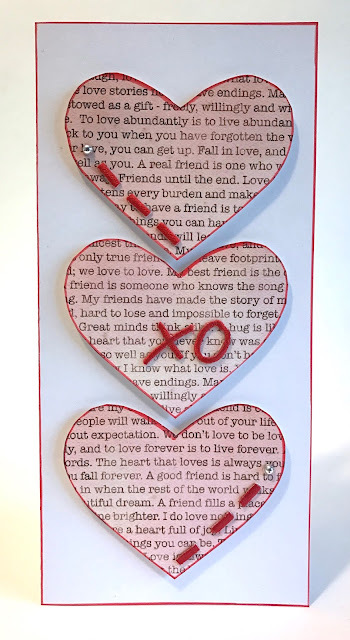 I cut out three hearts from some lovey-dovey conversation cardstock and inked the edges with a red marker. Then I glued the stitches and other letters into place as shown. Using a toothpick helps apply glue to the tiniest of pieces. 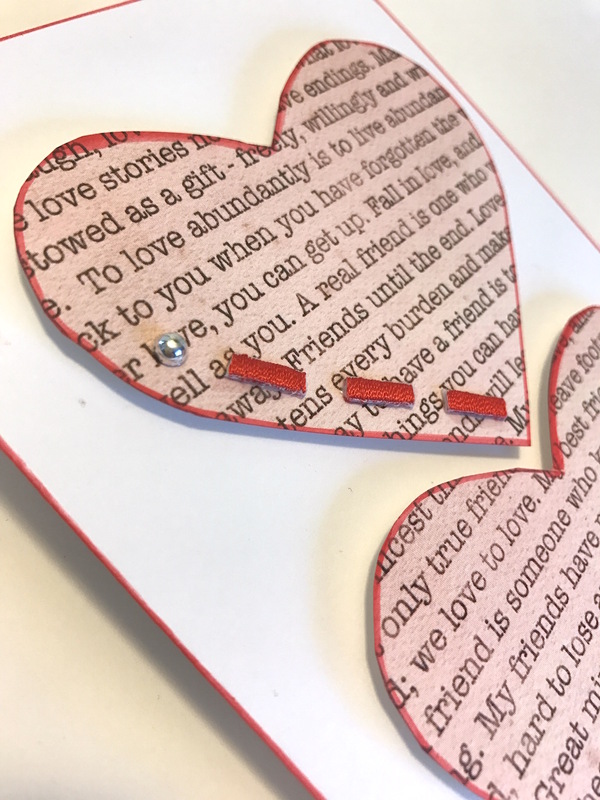 After adding a couple metallic accents, I attached the hearts to the folded card with dimensional adhesive foam squares. 1. 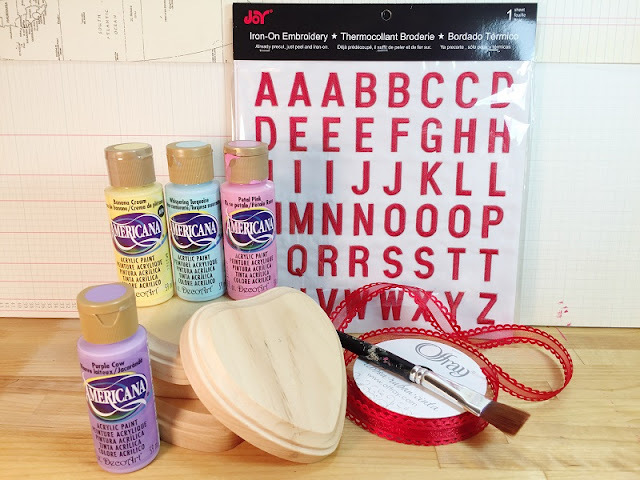 Gather your supplies - pastel paint colors, ribbon and wood heart plaques. 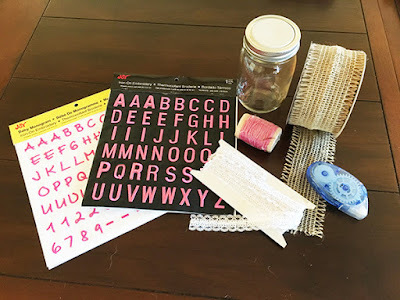 I had all of these items on hand, so I could craft from my stash - but everything, including the Joy embroidered letters, is available from your local craft store. 2. 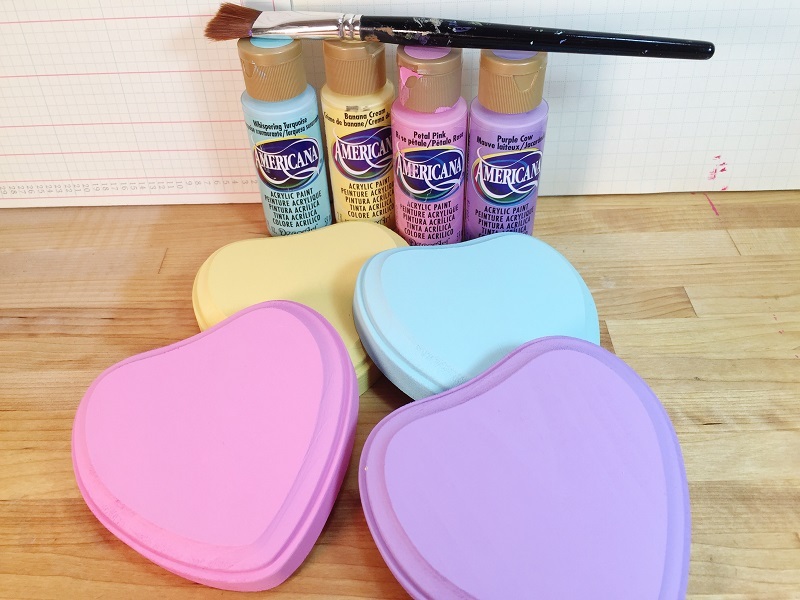 Paint each heart with 1-2 coats. 3. 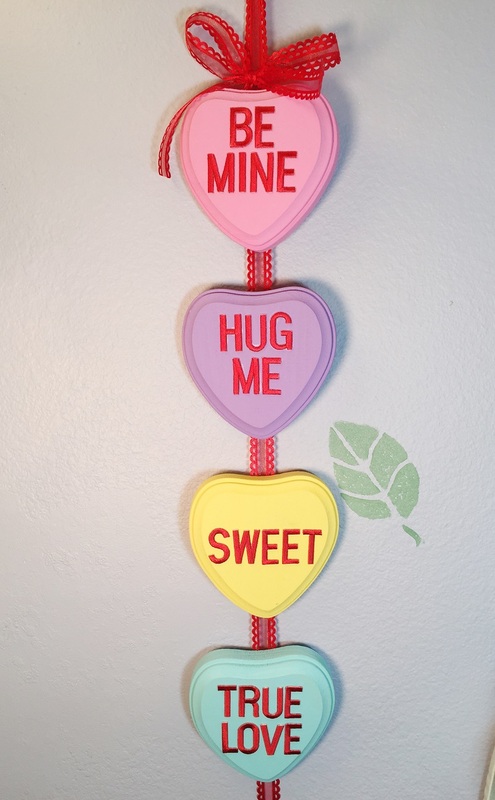 Spell out your messages to fit on each heart. 4. Iron the letters on to the hearts, according to the package directions. 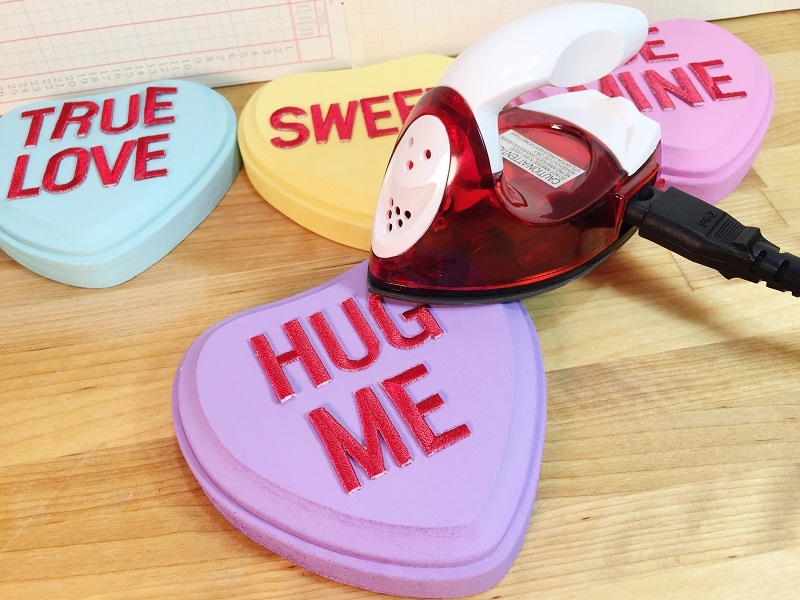 I always use a small craft iron because it is easier to see that you have lined up the letters straight and it doesn't have steam holes (a flat solid surface gives a better adhesion). 5. 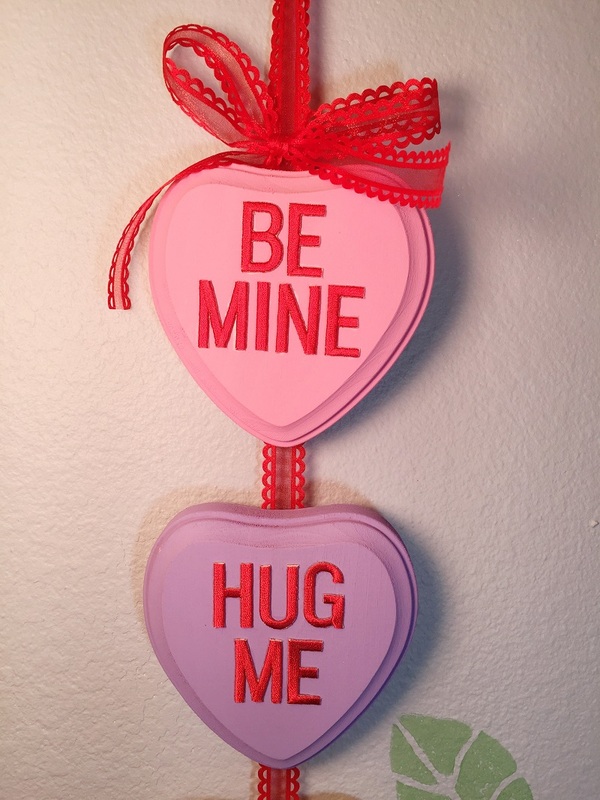 Glue each plaque to a 24" length of ribbon, leaving a 1" space at the bottom and between plaques. Fold over and glue the ribbon at the top to create a loop, then tie a bow with an additional 24" length. 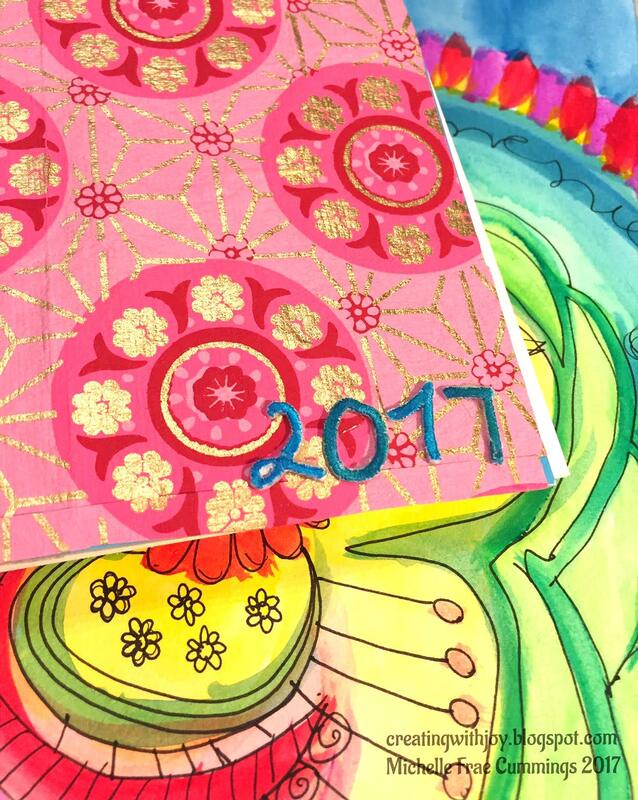 For even more inspiration, check out the Creating with JOY Facebook page! 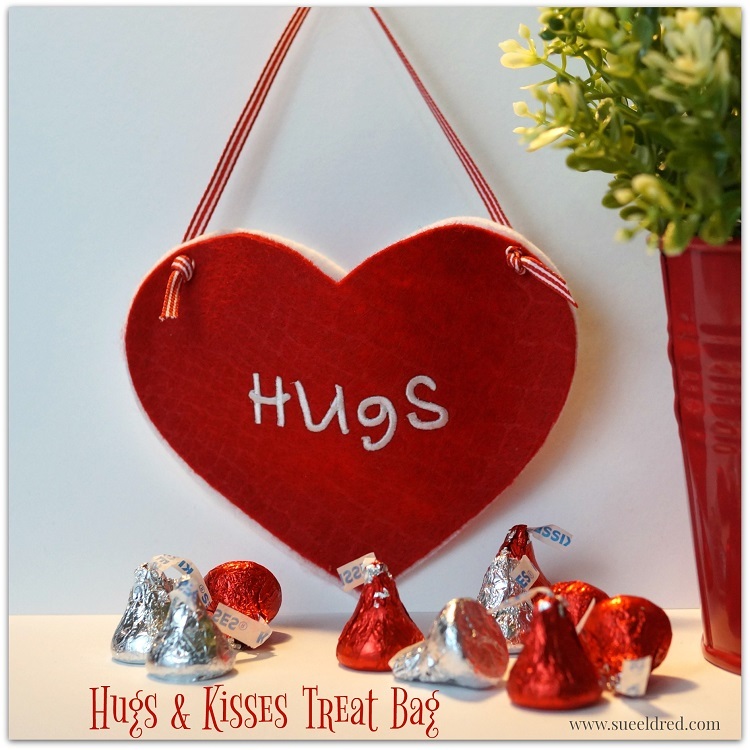 Make your little Valentine feel special with a handmade "Hugs & Kisses" treat bag. 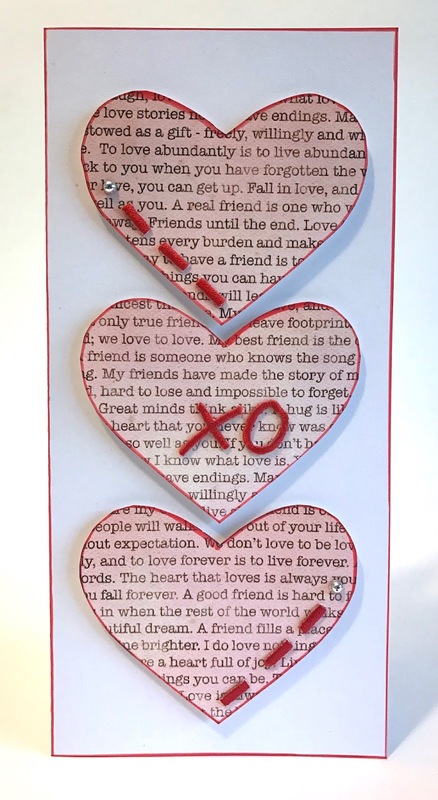 It's quick and easy to make - just cut two hearts from felt and glue the bottoms and sides together. Glue a sentiment or name on the front with Joy iron-on embroidered letters. A sweet way to share lots of chocolate kisses! A pretty floral headband is a fun way to dress up an outfit. They look great on girls of all ages and with all types of hair. 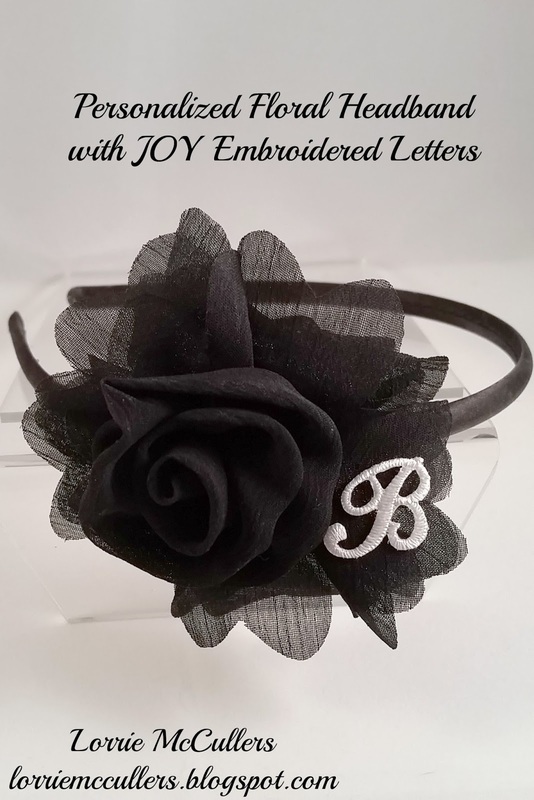 They are so easy to make and you can personalize it with a Joy embroidered letter to make it even more special! Place a Joy letter on one of the flower petals. 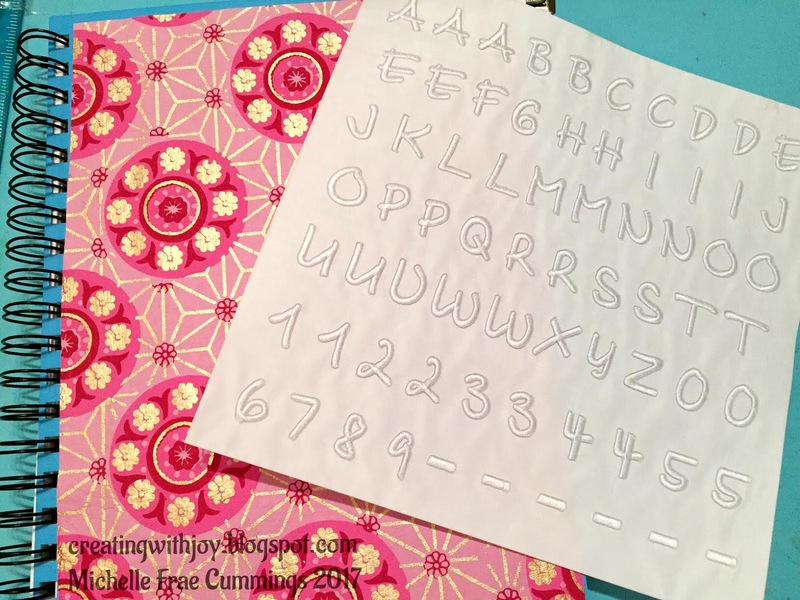 If the fabric is sturdy enough, iron the letter directly on to the flower. 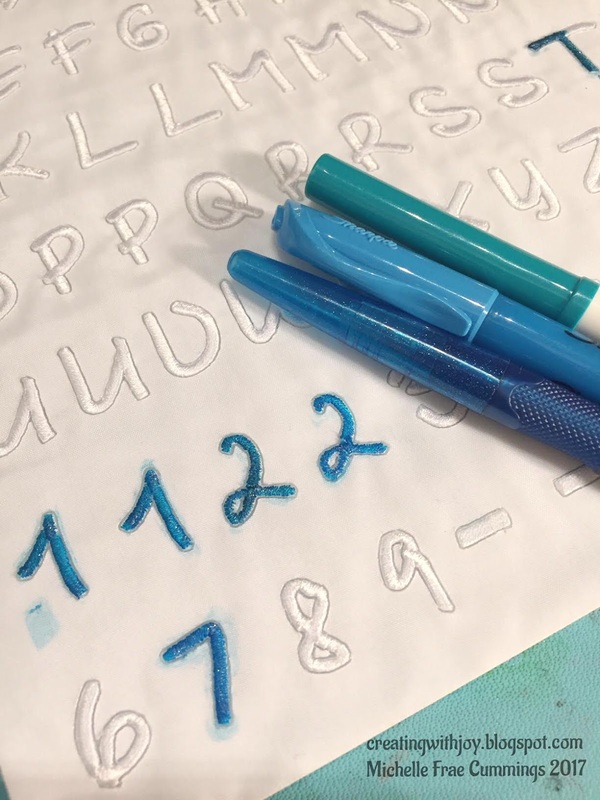 However, if the fabric is more delicate (like the photo above), glue the letter instead. Glue the flower to the headband - place it a little to the side, so it's positioned between her ear and top of her head. During the cold winter months, my family drinks tons tea, coffee and hot cocoa. 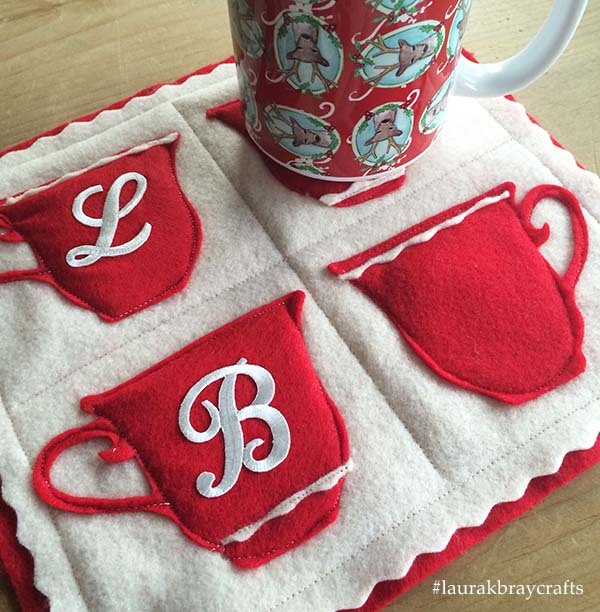 After growing tired of washing many mugs many times each day, I created this cute monogrammed family mug rug so everyone can put their own mug on their initial to keep track of it throughout the day. Cut two pieces of felt (I used one red, one cream) into 10" x 9" squares. I used a scalloped blade in my rotary cutter to trim a little more off the cream square. 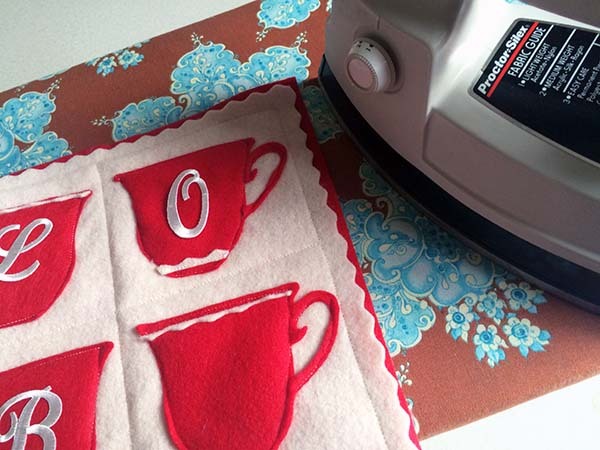 Cut four teacup shapes from the felt. 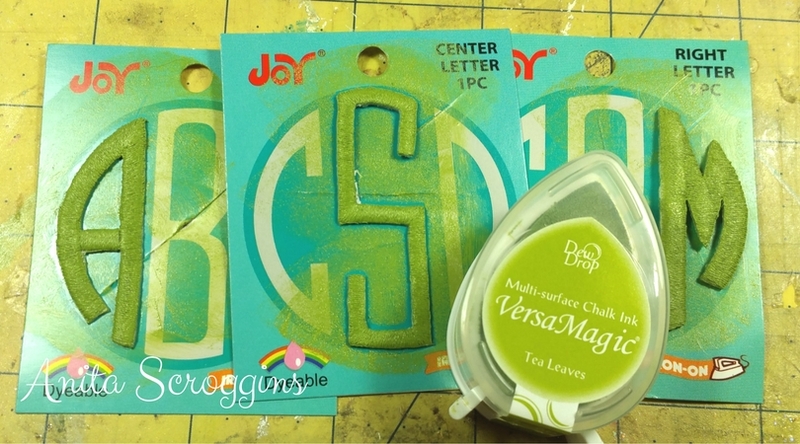 I used Eileen Hull's Teacup die to make mine. Iron-on a letter for each of your family members' names onto the teacups. When ironing onto felt, be sure to use a low heat setting and a pressing cloth. 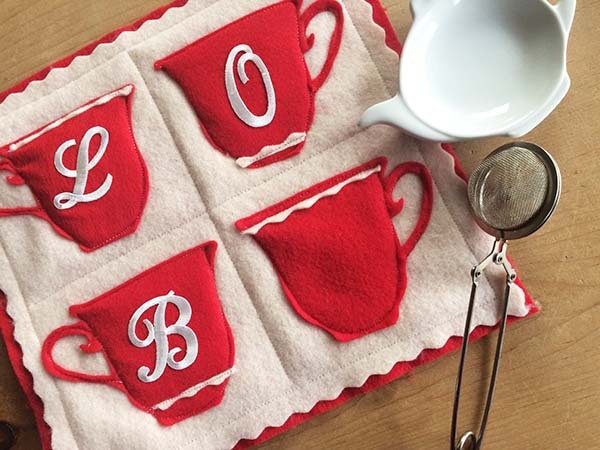 Stitch the two squares of felt together, then stitch the tea cups onto the front - by hand or machine. You can adjust the size of your mug rug based on how many family members you have. There's only three of us in my family, but I added an extra mug spot for guests. Slip regular or thermal batting between your two base layers of felt if you want to further protect your table or counter from heat. 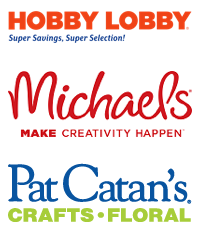 Get creative and add decorative elements to your mugs with trims. I added some scalloped borders - hearts, flowers, or polka dots would also be cute. I hope you stay warm and cozy this winter! Come and visit me on my blog for a great hot cocoa recipe to fill your mugs! I am a collector of strange things - old soap boxes being one of them. I have no idea why, I just like them. I have had this one for some time and decided it was time to do something fun with it. I saw these fun monogram versions of Joy embroidered letters on a recent shopping trip and knew they were perfect for this upcycled project. 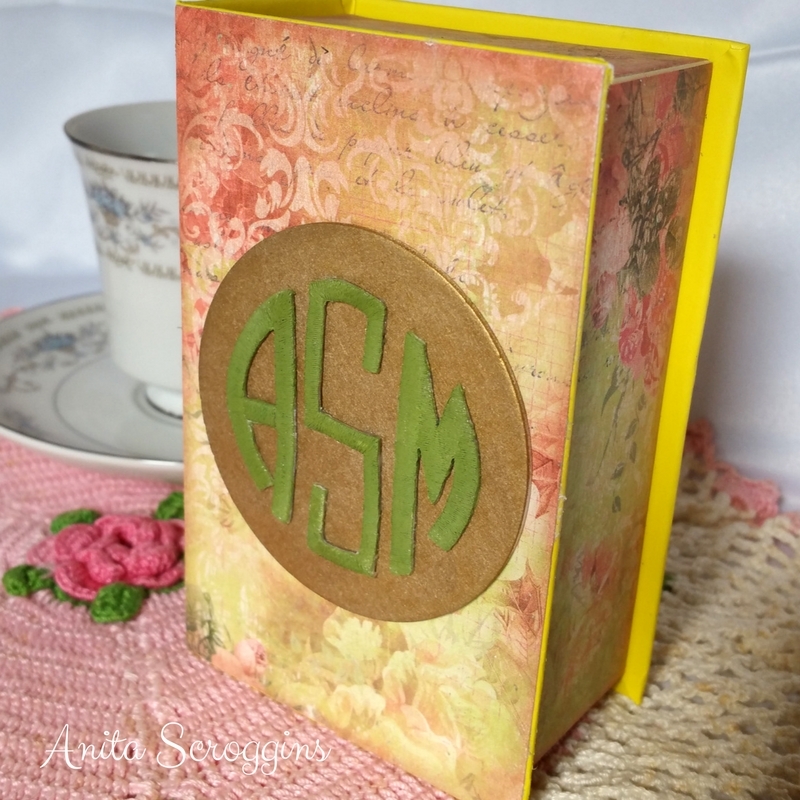 The letters are styled for each section of the monogram - just select the ones you need. I colored mine with a chalk ink while they were still attached to the packaging - no ink on the fingers! I covered each section of the box with a pretty patterned paper. 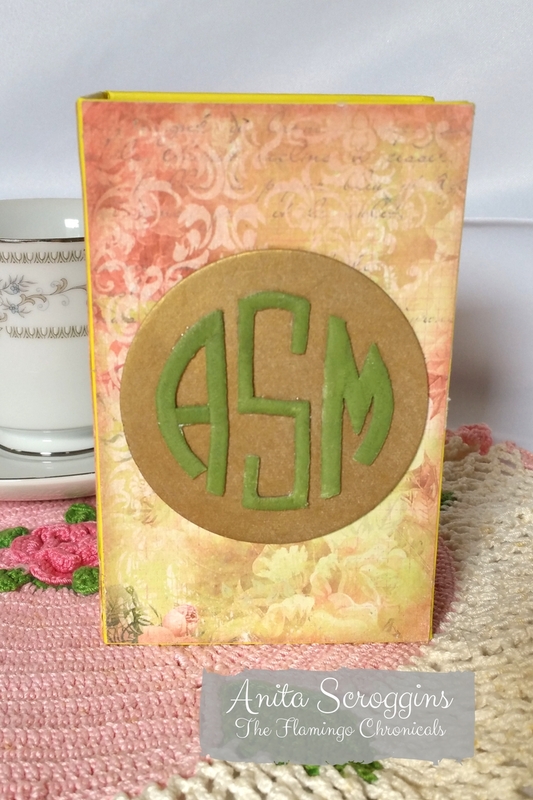 I wanted the monogram to really stand out so I grabbed a chipboard circle from my stash, covered it in a vintage gold cream paint, and glued the letters to it. I added the circle to the front of my decorated box and now it is ready to store my keepsakes. It's so easy to create garlands with Joy embroidered letters. Here I used pre-cut glitter foam snowflakes with blue letters. Since many styles of Joy letters have an adhesive backing to help with placement before ironing, I just peeled off the paper backing and stuck them right to the snowflake! I painted wood clothespins silver and clipped my message to silver ribbon. Use your favorite die-cut shapes to try this idea - it's great for any occasion and easy enough for the kids to do, too. A blank journal is almost like a sacred vessel. I guard it and keep it safe until that first day of the new year, when I can turn to that opening page and draw, paint or write anything and everything. Some will be scribbles while some will be colorful interpretations of my mind. 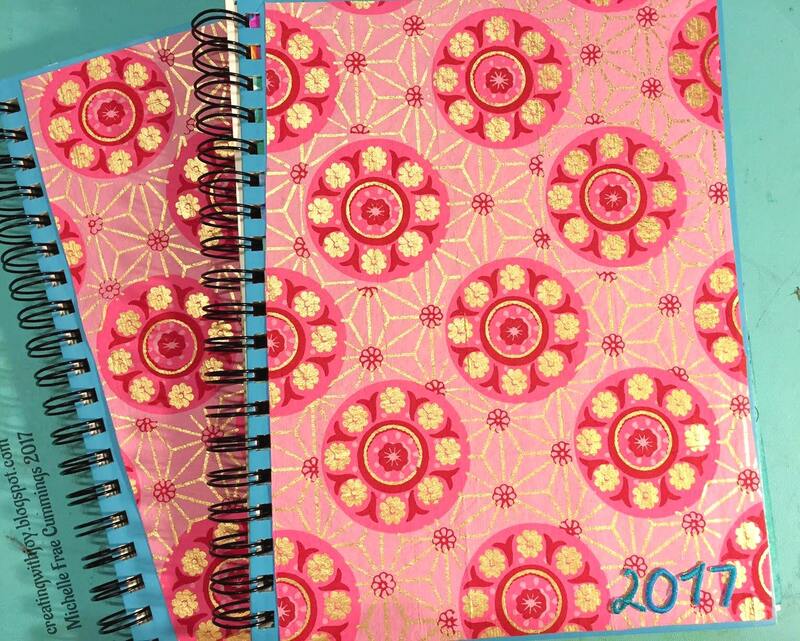 Open your journal and begin discovering yourself! 1. Glue your paper to the cover of your journal. 2. Color the Joy numbers with the markers. Half of the letter "T" makes for a extra #7. 3. Glue your numbers in place on the cover. Place a heavy book on top of them so they dry flat.